« Friend or foe in Brussels? Later today I will board an airplane and fly across the Atlantic Ocean with the assistance of a significant amount of sophisticated machinery. I can’t help but marvel at the way that dragonflies and damselflies, by contrast, maneuver through the air so skillfully and effortlessly. Wouldn’t it be cool to be able to fly like that? This past weekend I spent a good amount of time in one of my favorite photographic pursuits—trying to capture images of a dragonfly in flight. When I am traveling I usually don’t have my best camera gear with me and opt instead to use a Canon SX50, a superzoom point-and-shoot camera. It gives me a lot of reach, but is sometimes slow to focus and has a low frame rate. What that means is that I have to be even more careful than usual, because I can’t capture a lot of shots in an extended burst. Mostly I was trying to photograph Migrant Hawker dragonflies (Aeshna mixta) at the botanical garden in Brussels. 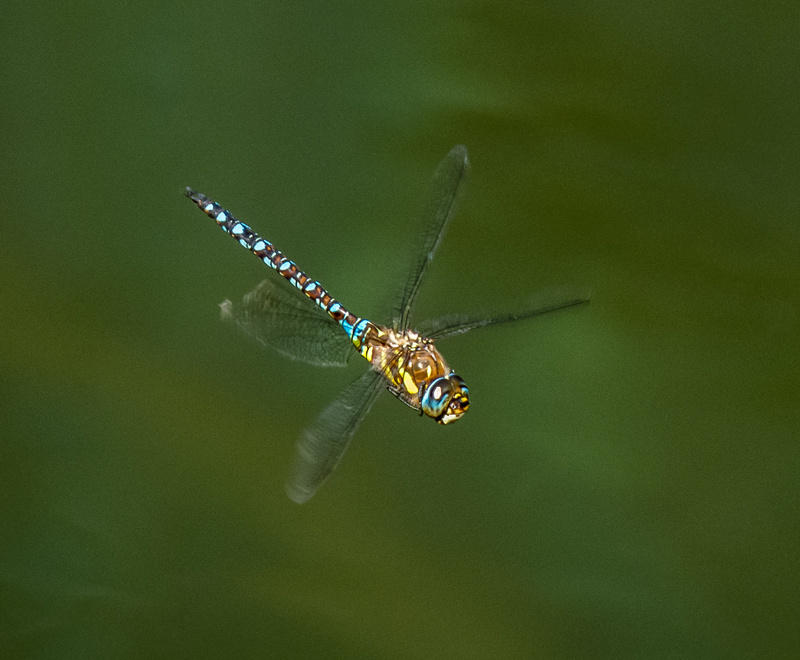 The good news is that Migrant Hawkers are relatively large in size and will sometimes hover a bit over the water. That increases slightly my chances of getting a shot, though many of my attempts resulted in cut-off or out-of-focus shots of the dragonflies. This was probably my best shot of the session. I like the way that I captured a pretty clear view of the body, including the legs that are tucked in during the flight and managed to get the eyes in relatively sharp focus. One of my Facebook friends commented that it would make a handsome piece of jewelry made with gold, turquoise and onyx—I totally agree with her. Nicely done, Mike. I’m using a Canon point and shoot and I’m lucky if I can capture a bird in flight. I’m glad this guy cooperated with you. There is a little button on the side of the camera which lets me pull back a little when the zoom is fully extended and then pops back to full extension when I have reacquired the subject. That really helps in tracking a moving subject. I was just telling my wife about that button. I haven’t successfully used it yet. This is an awesome photo, and I can totally understand how many useless photos it would have taken to get this one great one, but that’s all you need! Love the combination of colors on this beautiful dragonfly. So many people think that it’s easy to get shots like this, but it’s really only photographers who truly appreciate how a lot of things have to come together (including luck) to capture so many of our images. Very true! I never appreciated photos of hummingbirds so much until trying a thousand unsuccessful times to get a photo of one! So incredibly frustrating, but definitely puts those photos into perspective for me. Amazing, the mechanics of flight. Great shot helping us see what would be impossible without a stop action camera. Have a safe journey home, Mike. Thanks. I am safely back home now and ready to reengage with the local wildlife population, though there is a lot of rain in the forecast for the next few days. I have to mow acres of grass at work and I’ve noticed lately that there are dragonflies all around me when I do. The mower stirs up a lot of insects hiding in the grass and the dragonflies have discovered if they fly along with me they’ll get a good meal. Now I wonder if dragonflies learn or if it’s all just coincidence. I thought that little tidbit might interest you. Wow. I don’t know if dragonflies are capable of that kind of learning, but they are certainly opportunistic enough to take advantage of the sudden abundance of insects when you are mowing. I have always been intrigued by stories of the symbiotic relationship between species. I thought wow, there sure are a lot of dragonflies in this field but I’ve walked out there several times to get photos of them and they aren’t there. Only when I’m mowing! Nice Mike! Especially since it was flying! Thanks. When I am in the right kind of mood, I love trying to capture shots of dragonflies in flight. There are a number of techniques that I try, depending on the camera/lens combination. It’s such a cool feeling on those rare occasions when it actually works and I manage to get a relatively in-focus shot.